“Now you’re going to find out how crazy we really are!” Don claimed. If he was “crazy” for wanting a cat-sitter, well, I was too. I stopped kenneling my pets since the family collie died in one over our family vacation; I was 6 years old at the time (more than a few decades ago). Like Don and his wife MaryAnn I didn’t want a pet-sitter to just pop in for feedings (and in the case of dogs, walkies, in the case of kitties, litterbox cleanings). I wanted them make my home, theirs, and hang out with my beloved fuzzy babies. Don and MaryAnn said. Yup. 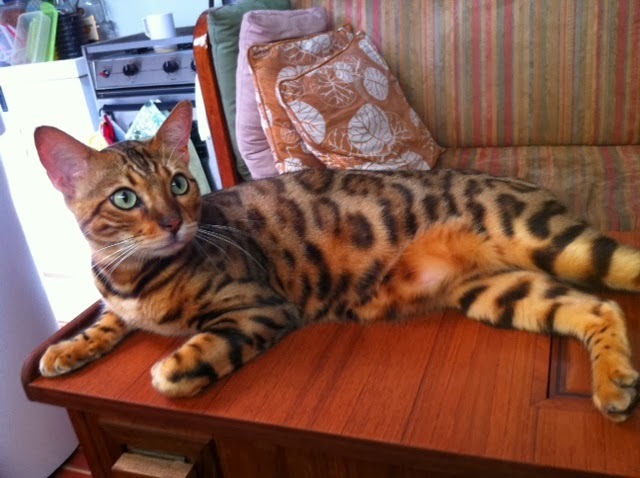 And yet, I considered pet sitting a boondoogle -- 2 weeks R&R on a nicely appointed boat twice the size of ours, with an adorable Bengal kitty (click here to learn more about Bengals), Kai. 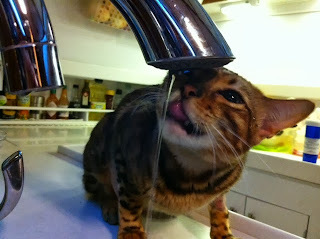 I was a drop-in cat sitter for Kai once before, for 4 days, and enjoyed it thoroughly. It was a beautiful bonding experience. Kai is a very special little guy, as affectionate and playful as he is handsome. 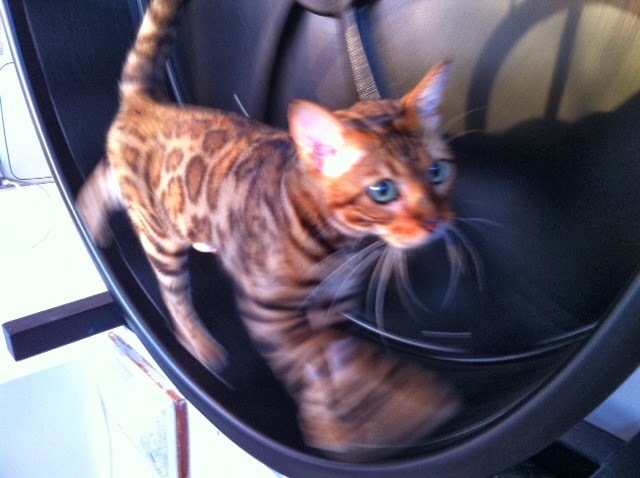 He even has his own special wheel for keeping him fit; something Bengals appreciate. 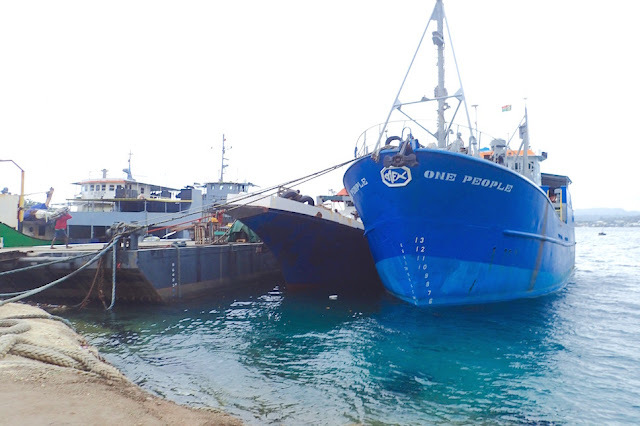 Plus, of late, living on our smallish boat had become particularly challenging. As fellow Pearson friend, Allen Willis of Incommunicado quipped, “There’s 2 rooms on a Pearson – inside, and outside.” My husband works a graveyard shift, 11 pm - 7 am, thus wanted to sleep in utter, motionless, odorless silence throughout my waking hours. His waking hours were my sleeping hours. The situation was untenable. Everywhere naturally includes the now-varnished settee table. 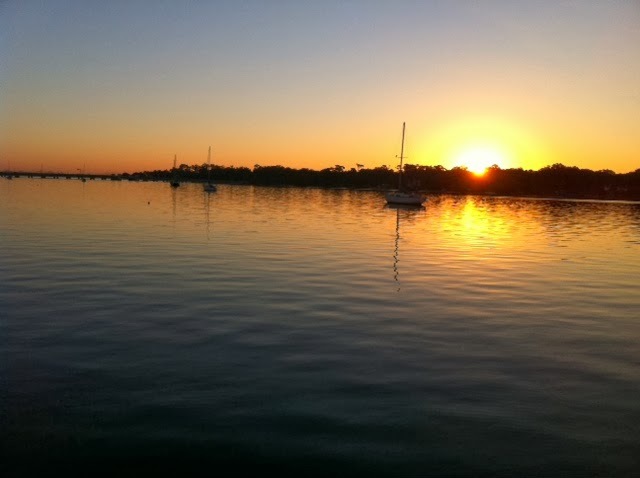 Over several hours, two nights before they left, MaryAnn and Don spelled out Kai s routine, and the boat basics (don’t use the aft head, manual river water flush, use the head for #1 only, no toilet paper in the bowl.”) No biggie. It was a far shorter walk that I’d already taken regularly from my boat to the marina’s bathroom for #2. This is why cruisers use other cruisers for pet-sitting! “By the way,” Don and MaryAnn all-too-casually mentioned, “”You don’t mind if the settee table gets varnished by Jerry while you’re gone, do you? He’s using low VOC [not too bad for you or stinky] products.” "Sure," I responded, "no problem." 'twas a sure sign he was feeling better. It was after Don and MaryAnn flew off, that Jerry pointed out the hiccup in those plans. “What do you want to do with Kai? ” he asked, pointing out, "Cats and wet varnish don’t mix." Jerry was using Minwax polyurethane fast dry varnish; it would take about 4 hours for the varnish to dry. It would take 2-3 coats, requiring dry time between each coat. Don, MaryAnn and I conferred over the phone. The decision was to lock Kai in the v-berth before Jerry brushed on the varnish. The v-berth was an area Kai liked to hang out in. His litter box was already there, it was just a simple matter of also bringing in his food and water, not too close to his litter box, then close the door with him inside. And keep him there until the varnish dried. 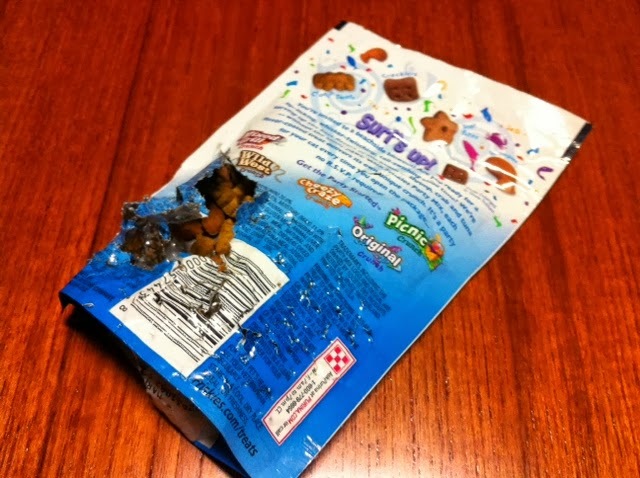 Prior to their departure, Kai never tore into his treats bag. He is now a master at it. Somehow, I managed it, though it became progressively more challenging to close Kai up each time. Fortunately for me, his love of treats trumped his caution just enough to pull it off. To my surprise, Kai was surprisingly forgiving, happy for some kitty massage, cooing and play afterward. However, he acted out his kitty PTSD secretively. I knew something was up when he was barfing…. A lot. First I figured what went down must come up, and nature would take its course. When Kai got up in the morning and deviated from his daily wake up eating and drinking routine, I got him into the vet, ASAP! is simply gas / antacid from an upset stomach. 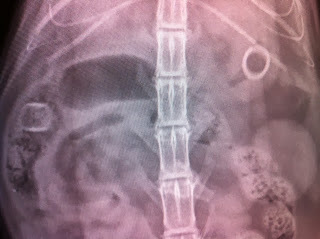 They took an x-ray, and found 2 foreign objects inside Kai. Since it was a Friday they suggested I watch him for 24 hours and decide to take him to the Pet Emergency Hospital if needed, or, to take him there … now, for surgery. With MaryAnn’s blessing, I whisked Kai off for surgery. They removed both pieces, determining they were the plastic-rubber nub. He’d chewed it in two, then swallowed it. There were many of these readily available aboard, holding his favorite kitty toy feathers together. They are now locked up. Kai was discharged with pain meds and antibiotics, each to be administered as needle-less mouth shots, twice daily. He got his kitty collar off 3 times in the first 1 1/2 hours. "MaryAnn, your cat is too damned smart!" I complained over the phone. "I don't like the way this conversation is starting," she replied, waiting to find out what Kai pulled off this time. As luck would have it, Don and MaryAnn’s neighbor, Nathan, is an ER nurse. He offered to help, an offer I enthusiastically accepted. I am way too clumsy to successfully force-feed meds to unwilling felines. Nathan and I trussed up Kai, who very protestingly choked his meds down. 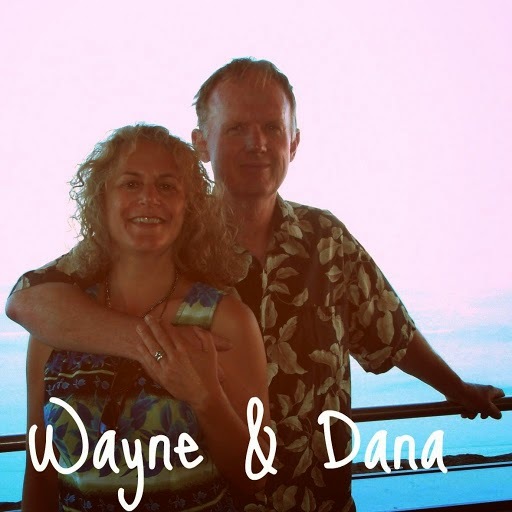 Kai’s exuberant health quickly re-established itself, to Don’s and MaryAnn’s and my relief. Maybe someday he’s show his Frankenkitty scars off to impress the ladies…..
Of course, not so sure Don and MaryAnn will ever vacation without their baby again. Or, if they do, whether they’d want me to watch him! Cat sitting, much like cat herding (click here if you’ve never seen that infamous video) is not for sissies! Last sunrise before checkout; will miss Kai and his view. Very cute narrative, Dana. Kitty has recovered quickly? I'm posting secretively, since I don;t hv accounts for any of the options listed. Other than the scars and hard tissue from stitches, Kai recovered rapidly and well, both physically and psychologically. He's my favorite kitty, ever (well, so far) so looking forward to cat-sitting for him again next week. No varnishing, though!!! !